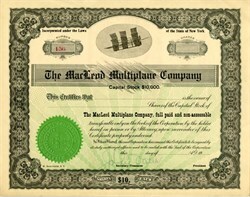 Beautiful signed but unissued certificate from the MacLeod Multiplane Company printed in 1911. This historic document has an ornate border around it with a vignette of MacLeod's Multiplane. This item has the signature of the Company's Secretary - Treasurer and Promoter, John T. Oats. This complex 18-wing triple triplane, powered by two 125 hp engines driving four propellers and was capable of carrying eight passengers, and was intended for a trans-Atlantic flight. Construction was started on Staten Island, but it was probably never completed. THIS novel flying machine is now being built on Staten Island to try for a flight across the Atlantic. The machine is known as the Macleod multiplane. It is what is known as an albatross in body, thirty-two feet from tip to tip on the upper story to twenty-eight feet on the second story, and twenty-four feet on the third story, six wings to each story. All are six feet wide. A hollow spar thirty-six feet long running through the multiplane will contain nine tanks of gasoline. One tank of gasoline will be exposed above the motors, making ten tanks in all. The power will be two motors, each of 125 horsepower. Four propellers will be used, each with three blades. The airship is being built to carry eight passengers. The builder says he will have it ready and will make the flight in August. Possibly he may have better success than other adventurous men have had with a similar purpose, notably Walter Wellman, who failed with a dirigible.